Last Firsts from a Soccer Mom. It is that time of year for parents of high school seniors when we’re enjoying the last -firsts of many club and high school events. Last first soccer game of the year, last first day of the last semester, last club night. Looking back at all the things I’ve learned, I’ve decided (rather than wallow), I’d share a few of the most useful lessons. From the importance of chocolate milk to the recruiting process. Make sure to catch next few blogs. I’d love to hear your stories and tips too! Here’s to team Glow Angel -where it all started, and to the coaches, parents and friends I’ve made on the fields. It’s finally soccer season!! I can’t believe it’s here—my senior year of soccer. It’s crazy to believe that at the end of this season, I will be done with high school. Senior night will be for me. It’s my last year in the CA jersey. Whaat. The last time I touched a soccer ball was 10 months ago, on our last game of last season. I had no idea how good or bad I would be getting back into it. For the first 20 minutes of our first practice back, the ball definitely felt foreign, but I’ll blame it on being indoors due to the snow, not my 10 soccer-less months. When I finally got adjusted, I remembered how much I love soccer. And competing. I had so much freakin energy and I was so ready to play 90 minutes against our biggest rivals. We’ve got big expectations for this year. I think our team is pretty stacked, and I personally believe a state championship is in our future. We’ll see how it goes! In the past few months, I’ve been able to work with and be exposed to some amazing women. As part of my leadership class, I had the opportunity to interview the head of a local independent school. She was the first woman leader at the school! She also played collegiate level volleyball and is now a coach. I wanted to get her take on all things: from her story, to leadership, to some advice for girls and women. My interviewee was talking specifically about how she almost failed her college Spanish class, but, this lesson is applicable to everybody. Whether it’s a teacher, a school subject, a coach, a tough sports play, a boss, anything; rise up and fight through it. Women, and people in general, wouldn’t be where they are today if they ran from their challenges. She said it all right here. No caption needed. Own it girls. This woman is doing amazing things and had a lot of great things to say about women. We need to keep women like her around! As this month is Breast Cancer Awareness month, women’s strength is highlighted more than ever. Dragon Wing is supporting funding for Breast Cancer Research, by selling these bras! Take a look and help a great cause! Monica watched her 10-year old granddaughter on the softball field as she adjusted her uniform again and again, tugging at the bulky compression shorts that were bunching up under her uniform. The girl glanced around self-consciously each time to see if anyone noticed. That’s our goal: empower girls to play — and be — their best without being distracted by sports apparel that doesn’t fit properly. Monica’s granddaughter loves the way her compression shorts fit: stretchy enough to move with her but not bulky like her old shorts from a big-box store. And the mesh side panels and moisture-wicking fabric meant she stayed cool under her uniform. After a long, cold winter just about everywhere in the US, what a relief it is to have warmer weather and longer days. Practices and games that occur during the heat of the day can bring the risk of dehydration, especially for young athletes. Staying hydrated can help athletes feel and play their best. The U.S. Soccer Federation uses the acronym GOAL for its recommendations for youth athletes, parents, and coaches. Get acclimated: Young athletes especially need to give their bodies time to adjust to higher, more humid temperatures. Wearing shorts, tops, and sports bras made of moisture-wicking fabric (not cotton) helps your body cool itself. On-schedule drinking: Don’t wait until you feel thirsty. Increase how much you drink throughout the day, every day. Develop the habit of drinking a glass of water before you go to bed or when you get up in the morning. And be sure to drink before practice or a game, too. Learn the signs of dehydration: dizziness, nausea, chills, and unusual fatigue. If you experience any of these, stop playing, move to a cooler location, drink fluids, and – most importantly – notify a coach, parent, or other adult. What you wear can help keep you cool, too. Dragonwing girlgear is made from fabric that wicks moisture so your body stays cooler. Check out our new Mesh Racer Sports Bra and Un-Dee Light Compression Shorts. 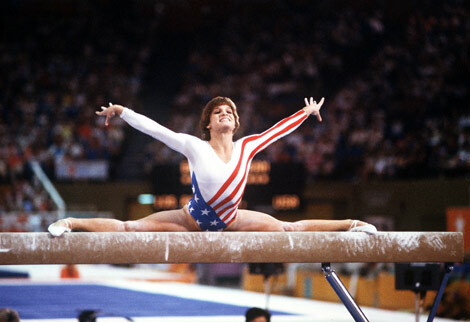 January 24: Happy Birthday, Mary Lou Retton! Happy birthday to Italian-American Mary Lou Retton, the first female gymnast from outside of Eastern Europe to win an Olympic gold medal in the all-around event (1984 Olympics). Besides four other Olympic medals- two silver and two bronze- Retton is also a two-time American Cup winner and a 1997 International Gymnastics Hall of Fame inductee.